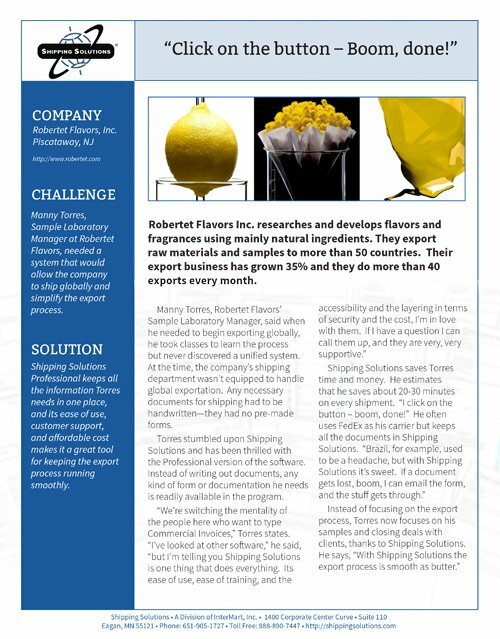 Export Document Software Case Study - Robertet Flavors, Inc.
Manny Torres, Sample Laboratory Manager at Robertet Flavors, needed a system that would allow the company to ship globally and simplify the export process. Shipping Solutions Professional keeps all the information Torres needs in one place, and its ease of use, customer support, and affordable cost makes it a great tool for keeping the export process running smoothly. Robertet Flavors Inc. researches and develops flavors and fragrances using mainly natural ingredients. They export raw materials and samples to more than 50 countries. Their export business has grown 35% and they do more than 40 exports every month. Manny Torres, Robertet Flavors’Sample Laboratory Manager, said when he needed to begin exporting globally, he took classes to learn the process but never discovered a unified system. At the time, the company’s shipping department wasn’t equipped to handle global exportation. Any necessary documents for shipping had to be handwritten—they had no pre-made forms. Torres stumbled upon Shipping Solutions and has been thrilled with the Professional version of the software. Instead of writing out documents, any kind of form or documentation he needs is readily available in the program.